Steam mops and cleaners have grown in popularity in recent years and there continue to be new innovations and new models regularly launched. So what is so great about using a steam cleaner? Firstly, high temperature steam is used to clean floors and surfaces rather than water and cleaning products. This is generally regarded as more effective and also has the added benefit of killing bacteria. Steam mops can also be used with just water so there is no need to use other cleaning products, so this could work out cheaper in the long run. Steam mops are safe to use on a variety of surfaces including various floors, upholstery and even clothing. Finally, another advantage is that they can also be used to clean kitchen ovens and grills, BBQs and tiled surfaces. So, a steam mop has many advantages but which one is actually the best? We’ve researched dozens of steam mops to narrow this list down to the very best of the best. Is a steam mop good for cleaning tile floors? Do steam mops damage vinyl floors? What is the best steam cleaner for cleaning grout? What’s the best steam mop for use on hardwood floors? I just want a handheld steam cleaner: which one is best? The Vileda steam mop is one of the best selling on Amazon.co.uk. It’s reasonably priced (usually available for under £50) but this is a fairly basic mop with limited features. Heat up time is typical of most steam mops but the actual steaming time is longer than most at 28 minutes. This mop does have an adjustable steam quantity setting which is useful if you need to use on more delicate flooring surfaces. A carpet glider is included with this mop and this can be attached directly to the cloth mop head to give your carpets a quick refresh (it won’t be as good as a carpet cleaner though). This is also a fairly light mop weighing only 2.5kg. This mop does not come with any attachments so will not be suitable for cleaning more intricate surfaces, such as tile grout. Has a decent 2 year guarantee. A decent steam mop but we would prefer a few extras at this price point. The Vax S7 has been on sale for a while now but is still one of our top picks. This is a steam mop with a detachable handheld steam cleaner. It’s priced usually around the £50 mark so puts it very close to the Vileda in terms of price. 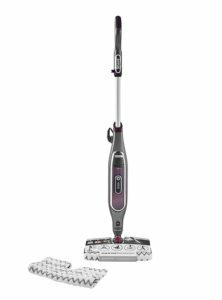 This model comes with a lot of different attachments for all cleaning tasks, including a carpet glider that allows you to use your steam mop to freshen up carpets. 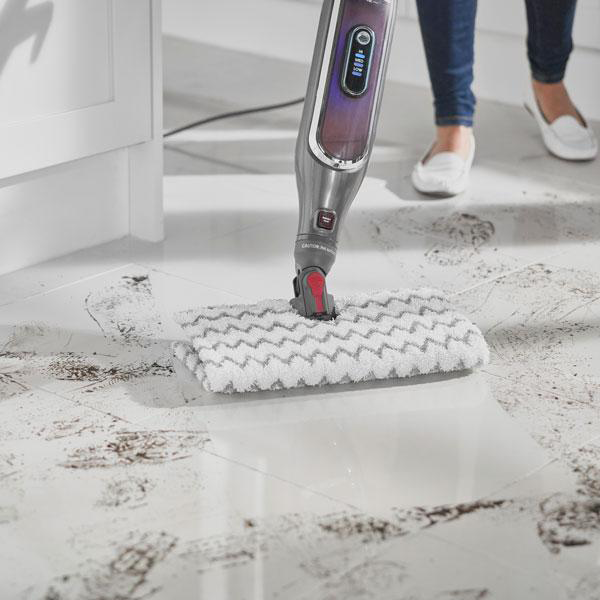 The S7 does not have a variable steam function (unlike the Vileda) so we would not recommend this steam mop if you intend to use on very delicate floors. Steaming time is also quite low at around 15 minutes. The S7 is a good all-round steam cleaner but if you wanted just a steam mop then the Videla may be the one to choose. LEARN MORE: Check out our full review Vax S7 Total Home Master. The Vax S86 is one of the more expensive steam cleaners we researched (along with the Shark) with an RRP of £150 (but you’ll usually find one for under £100). 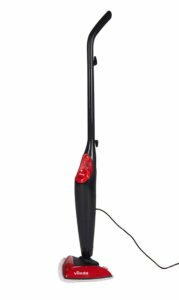 This model is a steam mop with detachable handheld cleaner and features two liquid tanks: one for water (steam) and the other for detergent. While this is a good idea we think that a lot of people buy steam cleaners to avoid using chemical cleaning products, plus to be on the safe side you’ll probably have to stick to Vax’s own detergent. You can use with just water though. The S86 comes with all the attachments you need for cleaning as well as a carpet glider for freshening up carpets. This model also features variable steam control for use on different floor surfaces. The handheld is quite bulky, but this is typical for “2-in-1” style steam cleaners. Overall, we really like this steam cleaner from Vax: it’s a bit on the pricey side but has some good features. Check out the Vax S7 first though as this is much cheaper (but does not have the variable steam function). LEARN MORE: Check out our full review of the Vax S86-SF-CC Steam Fresh Combi. Vytronix is not a brand we’ve heard of much before, but this steam mop is one of the bestselling ones on Amazon right now. It’s not hard to see why as it’s also one of the cheapest available as it can be had for under £40. 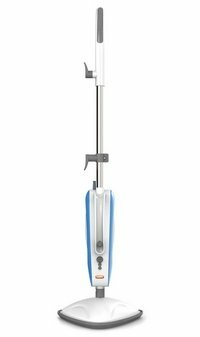 This is currently the only steam mop in the Vytronix range and gets very good reviews, mainly down to its value-for-money offering. This mop has a similar steam time to the Vileda and also has adjustable steam control. However, the Vytronic comes with a number of attachments for handheld cleaning, such as grout and upholstery brushes. A carpet glider is also included. This mop weights around the same as the Vileda and also has a long 6m power cord. The Vytronix only has a 1 year guarantee though. Although this mop is cheaper than the Vileda it includes more. 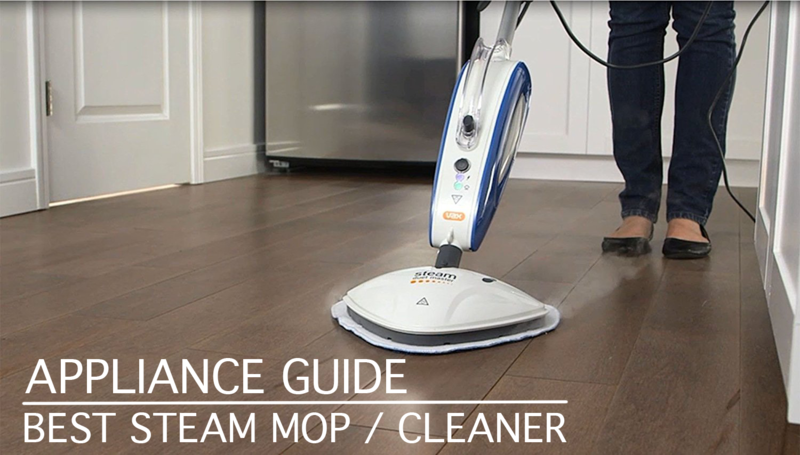 If you’re looking for a budget steam mop & cleaner, then this could be the one for you. The Karcher SC1 is a bit of an anomaly here as its more of a handheld cleaner with a steam mop attachment (rather than the other way around). This model is also quite pricey at £100 RRP (but much less usually on offer). It does seem overpriced though compared to some much cheaper competition; you can get a good handheld steam cleaner for under £30 but these usually don’t include the mop attachment. As with most Karcher products, the quality is pretty good and it’s also a good cleaner with around 3 bar steam pressure (it also features a child safety lock for reassurance). The handheld unit is very compact and light and with the addition of the flexible hose can be used for most steam cleaning applications. This model doesn’t include loads of attachments but does have the important ones you’ll need. Overall, we would say this is more suited for those looking for a good handheld cleaner with the added advantage of being able to steam mop as well. One point to note though is that you have to keep the steam button pressed at all times when using, so some may find this difficult or painful to use. The Shark S6003 usually sells for around £100 so is one of the more expensive steam mops here. Surprisingly though this model does not come with any accessories or a detachable handheld unit, it’s purely a steam mop. However, this steam mop does get excellent reviews for both its cleaning performance and the speed in which floors dry after mopping. An innovative feature on the Shark is the “Klik n Flip” mop head which means you can use both sides of the mop head for cleaning (it’s flipped over with a couple of moves of the mop). If you flip the mop heads out of the way, then you can use the “steam blaster” at the lower front of the mop to tackle stubborn dirt. The Shark has three steam settings rather than a variable control switch found on other steam mops. This is a quality steam mop offering good cleaning performance (we also like the Shark cordless vacuum range) with some innovative features, we just feel it could do with a few more accessories at this price, plus the steam time on one fill is very low at just over 11 minutes. The Morphy Richards steam cleaner has an RRP of £100 but usually sells for around £70-£80 which puts it’s in the mid-range steam mop & cleaner price point. 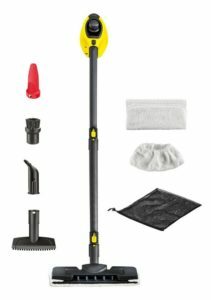 This model is a mop with detachable handheld cleaner and it comes with loads of attachments including the important grout, nozzle and upholstery ones. The handheld unit is quite bulky though and can become heavy when filled with water. This Morphy Richards model does not feature variable steam control which could be an issue if you need to clean both wooden and tiled surfaces with the same mop. This is quite an older model though so lacks some of the innovative features as say the Shark. It’s a good steam mop but we would rather pay a bit extra and get the Vax S86-SF-CC instead. LEARN MORE: Check out our full review of the Morphy Richards 720020. HANDHELD STEAM CLEANERS – these are typically lower priced and smaller units that are used primarily to clean smaller surfaces areas and items such as grills, tiles and BBQs. Typically, you would not buy one of these for floor cleaning alone. 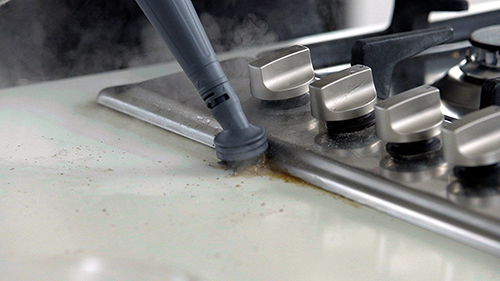 Check out our handheld steam cleaners buying guide for further information. STEAM MOPS – basic steam mops are designed for cleaning sealed hard floor surfaces, such as wood, laminate, lino or tile. Some of the best steam mops also come with a carpet “glider” attachment that allows you to “refresh” carpets when steam cleaning. This does not replace a carpet cleaner but does a decent job of making them look revitalised. Steam mops are often available cheaper than a steam cleaner/mop unit. STEAM CLEANERS – these are generally 2-in-1 units that feature a steam mop with a detachable handheld unit (both mop and cleaner share the same steam generator). This is great because you can clean different floor surfaces with the added benefit of having the detachable unit for more portable and detailed steam cleaning (such as tile grout, ovens or upholstery). Steam cleaners will often come with a wide variety of attachments such as different steam nozzle sizes and special fittings for upholstery, oven or even steam cleaner attachments for grout cleaning. Each of the three types offers their own pros and cons. For floor cleaning, avoid the standalone handheld cleaner and look for a steam mop or 2-in-1 steam mop/cleaner combination as these will offer the best value in the longer term. WATER TANKS – all steam mops or cleaners need to be filled with water to generate the steam. This is normally done by removing and filling a small plastic container. Most models have tanks that are between 400-500ml so make sure the steam cleaners or mops you compare have a specification similar to this. HEATING TIME – the cleaner or mop need to heat the water once filled. The heating time varies depending on the water tank size (how much water to heat) and heater power. For steam mops, the typical time to heat is between 30 seconds and 1 minute. STEAMING TIME – once you are ready to go with steam then another important factor is the actual time you will have to steam clean before you have to stop and refill. Most steam mops will provide you with 10 to 15 minutes steaming time before you have to return to the sink. Some models offer up to 20 minutes cleaning time which provides decent cleaning time between fill-ups. ATTACHMENTS & TOOLS – most steam mops and cleaners come with attachments that can be used for a variety of applications and surfaces. Makes sure the model you choose has at least some attachments so you have the flexibility at a later date (even though you will probably end up not using some attachments!). Common accessories include extension nozzles and attachments for upholstery, garment cleaning, worktops and window cleaning. Also included with some models are brushes and angled jet nozzles for cleaning kitchen appliances and difficult to access surfaces. 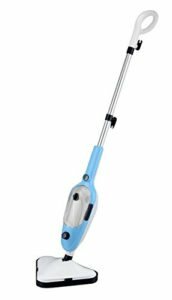 Look out for “2-in-1” steam cleaner/mops – these are models that are steam mops but have a detachable steam unit so can be used as a handheld device. WEIGHT – as with other home cleaning appliances such as vacuum cleaners, the weight of the steam mop or cleaner can be important. Steam mops are relatively light, between 2-3kg, but you have to add the filled water tank weight on top of this; so the bigger the tank, the heavier the unit will become. If you plan on using the steam mop frequently or you may have difficulty handling a heavy unit then it may be a better option to choose a lighter weight model. TYPE OF STEAM MOP HEAD – two things are important regarding the steam mop head. The first is the size and manoeuvrability of the mop head. Smaller mop heads will be able to fit into tighter spaces. Some models also have a swivelling head and are great for getting under furniture (some models have handles that lay flat in use) and up against skirting boards or kitchen plinths. The second point to check is what type of cover is on the mop head. Two common covers are used – disposable ones are easier to use but mean you have to keep buying, whereas re-usable covers can save you money in the long run. Yes, but you’ll need one that offers good steam power as tile floors can be harder to clean. We would also recommend you look at a steam cleaner with variable steam control if you have tiled floors. You’ll also want a steam cleaner with nozzle attachments so you can get into the grout areas. Most steam mops should be fine on vinyl floors but always check first before buying. You need a handheld cleaner for this plus a suitable attachment. Any handheld steam cleaner or “2-in-1” cleaner would be good for this. If the steam cleaner comes with accessories then it most likely has a grout cleaning attachment. For hardwood floors, you’ll need a steam mop that has an adjustable steam setting so you can lower the quantity of steam used. Also, don’t leave the mop stood in one place on the floor as this will leave a mark. Always check with the manufacturer though beforehand (for example, Shark state that the S6003 can be used on hardwood floors). The Karcher SC1 gives you the flexibility of a handheld cleaner with steam mop attachment. It expensive though so you probably just want a basic handheld cleaner – you can look out our buying guide for further info.